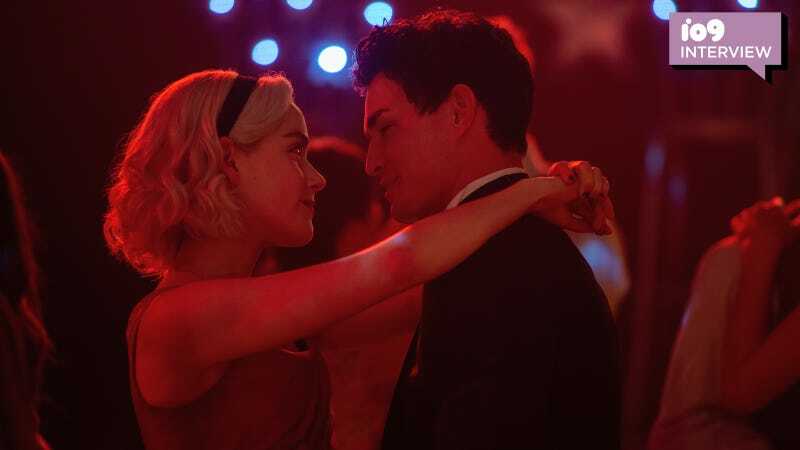 Sabrina (Kiernan Shipka) and Nick (Gavin Leatherwood) at the Valentine’s Day dance in Chilling Adventures of Sabrina. Shippers can be quite the dedicated bunch, and sometimes they really don’t like when someone gets in the way of their favorite pairing. When Netflix’s Chilling Adventures of Sabrina broke up Sabrina Spellman (Kiernan Shipka) and Harvey Kinkle (Ross Lynch) in the middle of the first season, Gavin Leatherwood prepared for the worst. After all, he was next in line. io9 visited the set of Chilling Adventures of Sabrina last year as the show was filming Part 2, which started streaming on Netflix last Friday (check out our thoughts on that here). The scene they were working on was from the high school Valentine’s Day prom in episode three, which came with two major surprises (at the time of the set visit, we had only seen the first five episodes of the series). First, Harvey was now dating Rosalind Walker, instead of Sabrina Spellman. Second, Sabrina herself had a new man on her arm: Nicholas Scratch, the bad boy from the Academy of Unseen Arts. In Part 2 of Chilling Adventures of Sabrina, it’s clear Nick has become really important to Sabrina, and vice versa. At the time, Leatherwood seemed a little nervous about how fans would react to him and Sabrina coming together, but it kind of makes sense for Sabrina to be drawn to Nick at this time in the series. Having signed the Book of the Beast at the end of Part 1, she’s now exploring the darker, more devil-worshipping side of herself. And who better to explore that with than Greendale’s necromancing bad boy? But just how bad is he? There have been theories about Nick going around for weeks—that he’s actually the devil, having already taken on human form to seduce Sabrina to the side of evil. Or that Sabrina’s dad has possessed him, which would be an icky but appropriate callback to the graphic novels. For those who’ve seen Part 2, you’ll know exactly how nice and naughty Nick gets this time around. But for Leatherwood, Nick isn’t a bad guy, necessarily. Even if he worships the devil...or may be one. “A lot of people ask if he is evil or if he is good. Deep down, I feel like Nick’s ultimate thing is he’s good at heart. He has a really good heart, but he’s been in this witch and warlock world for so long, that certain things don’t faze him as they would a mortal,” he said. Chilling Adventures of Sabrina is currently on Netflix with Parts 1 and 2, and has already been renewed for another two-season arc.